Tahoe's Phil Heisse pokes the puck away from an opposing player in a home game earlier this season. 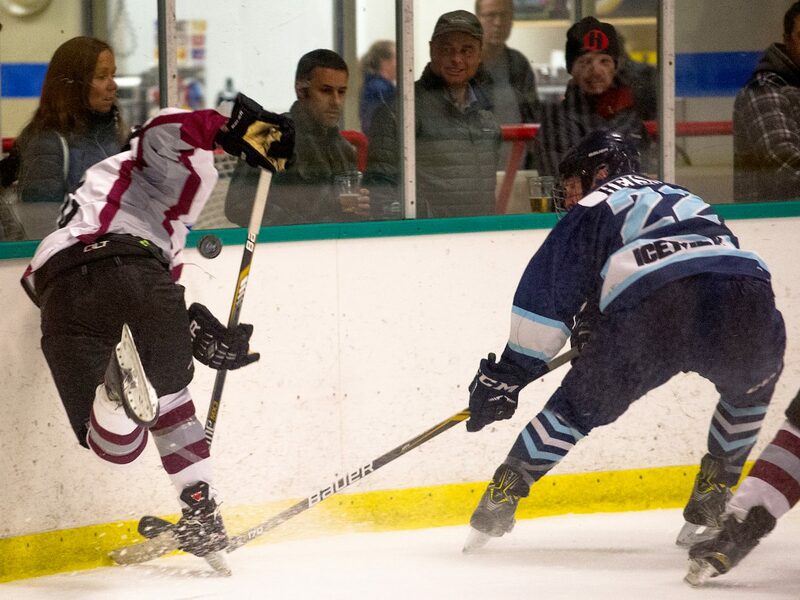 Though the Tahoe Icemen didn’t take a single point from the Utah Outliers this past weekend, the three-game set proved to be entertaining. A Saturday night fight led to two Icemen goalies leaving the pads behind and skating out Sunday in the series finale. The Outliers came in averaging 17 penalty minutes per game but against the icemen took a whopping 101 minutes over the three games. And Paul Frys extended his scoring streak to six games, netting seven points (three goals, four assists) during the series. In the series opener on Friday, Dec. 1, the visiting Icemen kept up with the Outliers until midway through the second period. Tahoe was tied 2-2 with Utah before the Outliers scored seven unanswered goals to run away for a 9-2 win. The game winner was scored at 8:10 in the second period. They led 5-2 after two periods and scored four more in the third. The referee didn’t call many penalties, six minutes in minors for the home team and 15 minutes for the Icemen, including a five-minute slashing penalty for Phil Heisse III. The Icemen scored two goals on only 10 shots and they didn’t put a shot on net in the third. Icemen goalie Wade Conlan faced 23 shots in the first two periods, but was relieved by Maximilian Haselbacher in the third. Haselbacher made 16 saves on 20 shots in the third. The Icemen’s 8-2 loss Saturday was rough. The Outliers jumped out to an early lead and never looked back. Utah’s Jacob Wanstrom had a natural hat-trick in the second, and four goals overall. Utah’s Alex McCloskey was ejected for fighting with 42 seconds left in the first, and the fighting didn’t end there. At the end of the second period, at least eight players were involved in a massive fight that resulted in an injury to a Utah player. Four players from Tahoe and another four from Utah would be unavailable for Sunday’s game, shortening the Icemen’s already limited bench. All told, the Icemen had 70 minutes in penalties including four five-minute majors while the Outliers had 79 minutes, including five five-minute majors. The Outlier’s goaltender Dawson Rodin allowed two goals on 23 shots. Haselbacher made 36 saves on 42 shots and was relieved by Thomas Spero in the third. Spero made 13 saves on 15 shots. With an extremely short bench on Sunday, Conlan took his spot in the net, but Spero and Haselbacher were put on the ice as position players, still leaving Tahoe with less than three full lines. Tahoe found some success, landing the first goal of the game and scoring 4 goals on only 17 shots against Utah’s Otto Saxin, but it wasn’t enough to prevail against the Outliers in an 8-4 loss. After two quick goals from Tahoe, the game was tied 3-3 in the second, but the tie would only last 2:01. The game winner went to Utah’s Dylan Massie at 5:33 in the second. After that, Outlier’s Kane Toriumi would score a natural hat-trick beginning in the second and carrying over into the third. Tahoe had 14 minutes in penalties while Utah had16 minutes. Conlan made 49 saves on 56 shots. Spero came in with under three minutes left in the third and made one save. The final goal was scored by Utah on an empty net. Tahoe’s next match-up is at home against the Idaho IceCats, who are ranked first in the Northwest Division. This will be an exciting series at the South Lake Tahoe Ice Arena on Rufus Allen Boulevard in South Lake Tahoe. Normally games are played Friday through Sunday, but this series runs Thursday through Saturday night. All games start at 7 p.m.